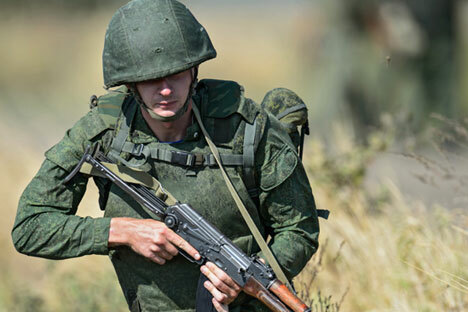 RBTH presents a selection of views from leading Russian media on international events, featuring a report on a number of Russian militants who are leaving the conflict zone in Ukraine to fight in Syria, analysis of Russian President Vladimir Putin’s plans for the future, and the results of a survey of the happiness of Russia’s elderly. The Kommersant business daily reports that the ceasefire in the Donbass region of eastern Ukraine has led to the birth of a new class of militias. Now they are going to fight not for the so-called "Russian world," but against the militants of Islamic State (ISIS). For now there are only a few of them: According to Kommersant, 12 Russians are waiting in Iraq to be sent to Syria. The expedition was organized by Donbass veteran and native of Tajikistan Bondo Dorovskikh. "These are former servicemen. Some earn money by participating in various local conflicts. Some are still not ready to return to ordinary life," Dorovskikh told Kommersant. However, there is still no talk of a mass deployment of Russian troops to Syria in order to fight ISIS. "It is too expensive, the logistics are too complicated and it is not clear who'll be the enemy. This makes it difficult enlisting in the military. Ideally, we would like to fight along Assad's troops but our requests have been ignored by the Syrian military," said Bondo Dorovskikh. According to Kommersant sources within the Russian General Staff, only Russian military experts are now present in the region, those that are teaching the government forces to use this technology, as well as security forces that are assigned to the Russian Embassy. The centrist daily Nezavisimaya Gazeta analyzes Russian President Vladimir Putin's plans, mentioned in a recent interview on American TV with journalist Charlie Rose, to run for another term. Rose immediately asked the Russian president how long he intends to stay in power. "This will depend on the concrete situation in the country, in the world and on my personal feelings," Putin responded. The newspaper writes that one of the main reasons why Putin would decide to continue his presidency may be the absence of good successor candidates. Nezavisimaya Gazeta also mentions a certain "perturbation" of the elites, without, however, explaining what it means by this word. Finally, another reason may be the issue of succession. If Putin steps down in 2018 the probability of him returning in 2024 is extremely low. Any decision not to stand for election would mean that Putin would not return to the presidency again, says Nezavisimaya Gazeta. But it is unlikely the president will decide to leave the country if it is in a critical situation. However, by 2024 everything may change (Russian forecasters are building their positive expectations for exactly eight years), thus in this case Putin would be able to leave as a winner. The happiest pensioners in Russia live in Chechnya, reports the Rossiyskaya Gazeta daily newspaper, citing a study prepared by the Rossiysky Pensioner information and analytical center. According to the study, 88 percent of respondents in Chechnya said they were happy. The residents of Russia's northern regions, such as Murmansk, Karelia and Komi, are the least content with life, with only 31 to 34 percent of the respondents saying they were happy. In total, only 45 percent of Russian pensioners said they were happy with their lives, 22.5 percent could not give a clear answer, while 32.9 percent spoke about problems that prevent them from being happy. In total, 86 percent of Russian pensioners said that their happiness depends most of all upon health, 82 percent – on material conditions, 81 percent – on family wellbeing, 77 percent – on love, 71 percent – on free time and 53 percent – on stability in the country and in the world.